Good Afternoon! Spring is here and in addition to highlighting our featured business members for March we are highlighting all of our business members for the Kansas City area by category breakdown (see table below). Congratulations to Kansas, K-State and Wichita State on a great year! Our area schools had an excellent year in basketball (congratulations to KU, KSU and WSU on some outstanding years! ), however the madness inherent in the NCAA Tournament has busted many a Kansas City bracket - and although we may still watch, those with a rooting interest in the local teams will undoubtedly focus theirs passions upon tasks at hand. Onward and upward! 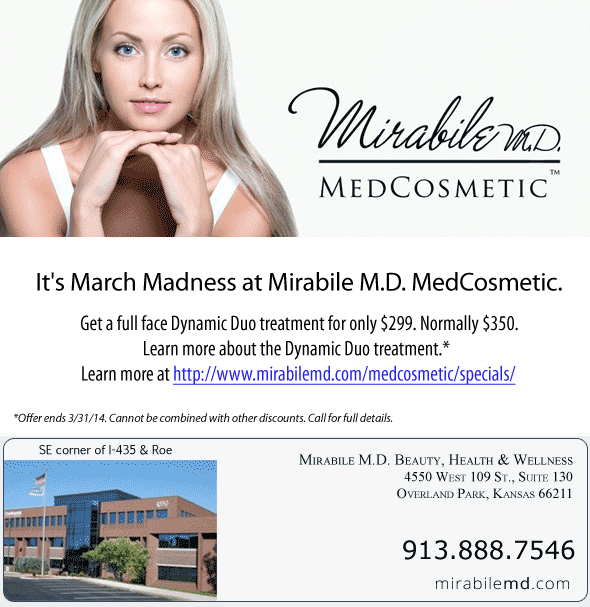 Get a full face Dynamic Duo treatment for only $299. Normally $350. Learn more about the Dynamic Duo treatment. March Madness specials: offers valid during specified promotional period only. Cannot be combined with other discounts or specials. Additional $75 off Juvederm is an instant Brilliant Distinctions rebate and is available while supplies last. Call 913.888.7546 for full details. Browsing through categories? Curious how may different Retail Establishments we have? Or B2B services? Save $20 OFF your first acupuncture treatment (1/2 price - $19.95 instead of $39.95) for w/ MyJoeCard! If you've been wanting to try acupuncture to relieve your pain, now is your chance! 10+ yrs experience treating & relieving lower back pain, neck pain, shoulder/rotator cuff. Call to schedule an Appt! 913-829-7246. Offer ends 3/31/14. Cannot be combined with other discounts. Call for full details. Get 2-for-1 Tickets at Stanfords on Broadway w) MyJoeCard (MUST CALL FOR RESERVATION, Limit of Four Tickets, excludes special performances - call for MyJoeCard rates to special shows). Click the link above for listings of upcoming big shows and show times! Kansas City's only LAN Gaming Center! Save 10% off your gaming experience w/MyJoeCard! Come game with friends, compete individually and as a team in our high-tech computer gaming rooms! Enjoy multi-player games together in a social game environment. Great for birthday parties. Save $10! Purchase an Aura photograph w/ printout + get an expert aura interpretation free ($10 value)! + Save 20% off your total purchase w/ MyJoeCard! * (MUST HAVE MYJOECARD TO REDEEM). <-- Check out our March 2014 Directory for Kansas City. Downloadable PDF highlights specials, savings and event at local businesses.